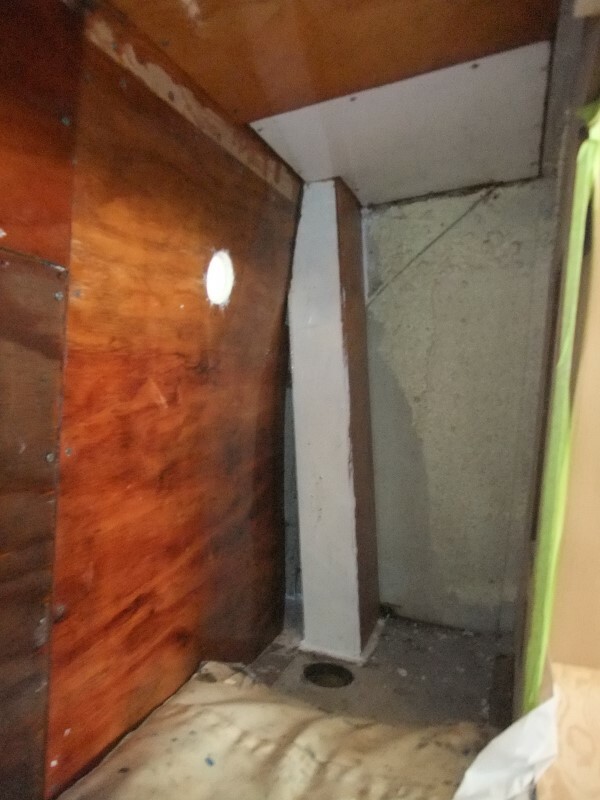 I wrapped up the last insulated plywood panel install inside the starboard salon cabinetry. 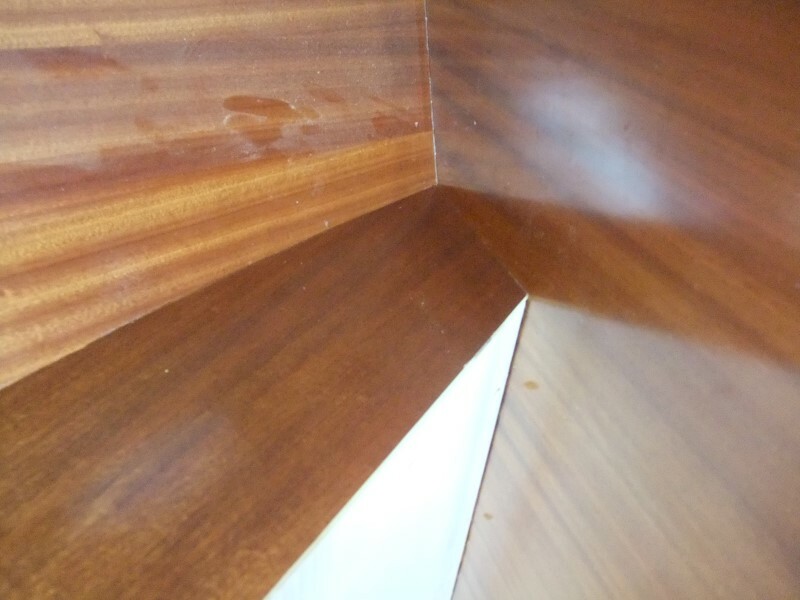 I am sick and tired of spending the weekend inside cabinets, so the timing's perfect. 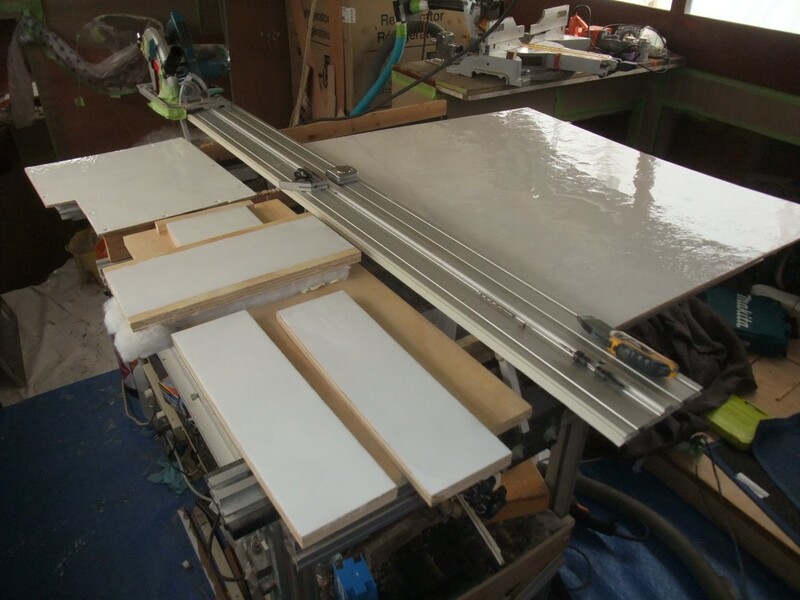 All of the other insulated panels in this cabinet have been just clear epoxy coated...a fact I wasn't thinking about when I mixed up a big pot of epoxy and tinted it white for another panel. I figured I'd do all of them at the same time. It was only when I went to install it that I realized this is the only white insulated panel. It won't matter since they're up inside the cabinet and will probably never be seen by any guest, but still, I laughed when I realized what I'd done. 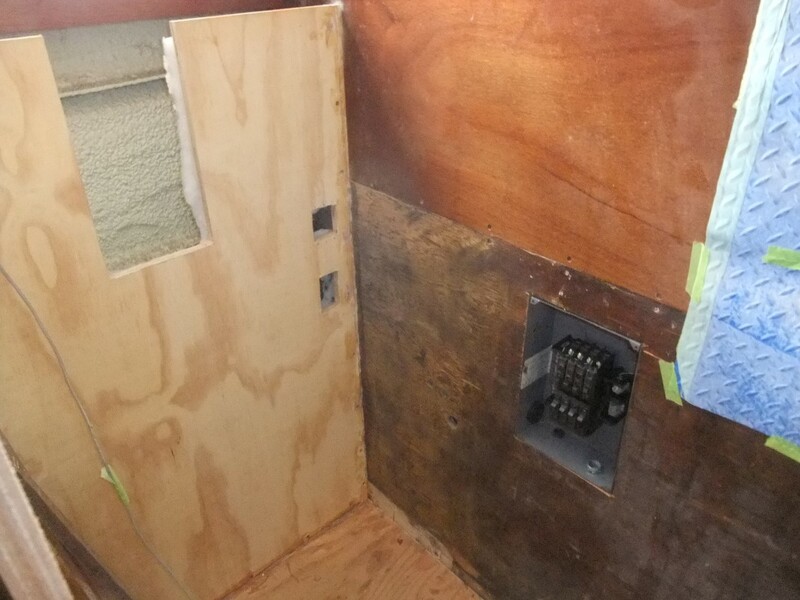 I dove back into the V-berth to button up one of the holes through the hull, specifically, the AC raw water outlet. As long as I'm installing a hose there, I decided to just get the raw water supply hose and all of the electrical done at the same time. 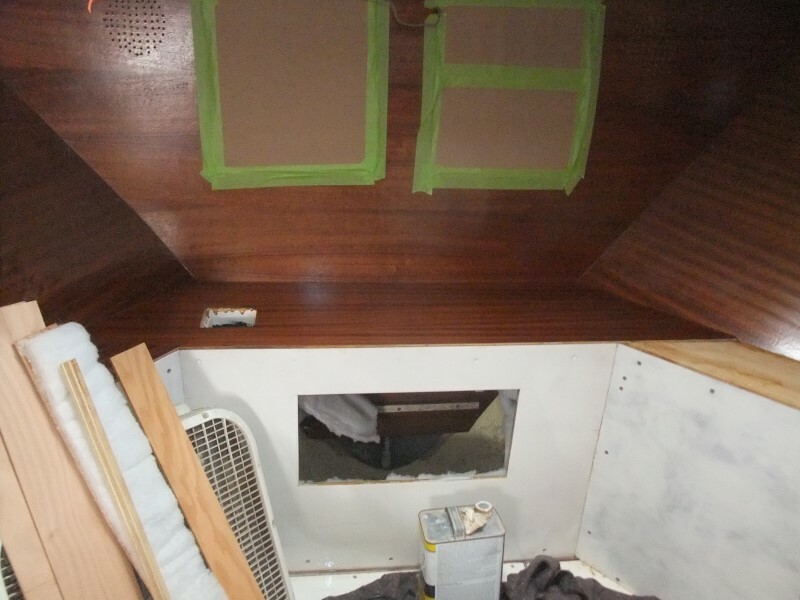 I got most of the ducting installed for the V-berth AC, which was the only thing holding me up from installing the last mahogany plywood panels. 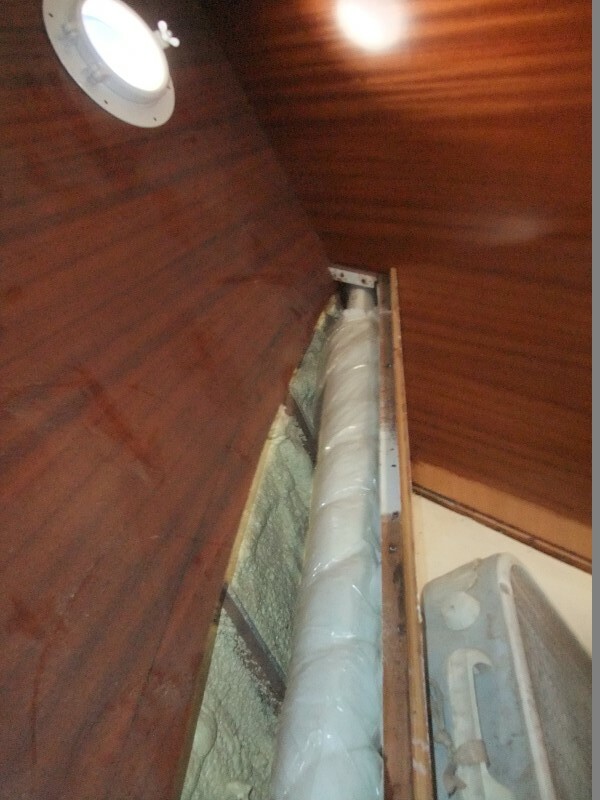 I used 4" insulated flexible duct going to the main outlet at the front of the V-berth. 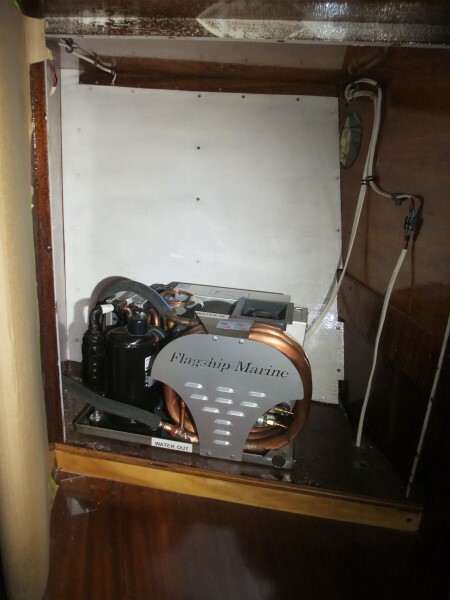 But because of the limited space crossing over to the starboard side, I decided to use 2" PVC as the duct supplying the head. I'll use a booster fan at the head AC outlet to pull more air through, but that'll happen later. 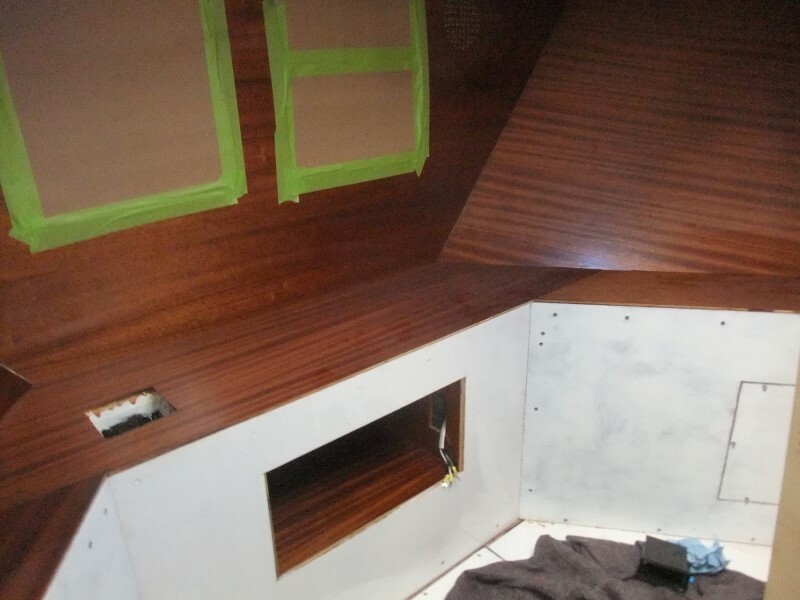 With the ducts, wiring, and plumbing installed, the last step was to install the final mahogany panels in the V-berth. I have to say...I think they turned out pretty good! How's that for some tight, complex joints?!! 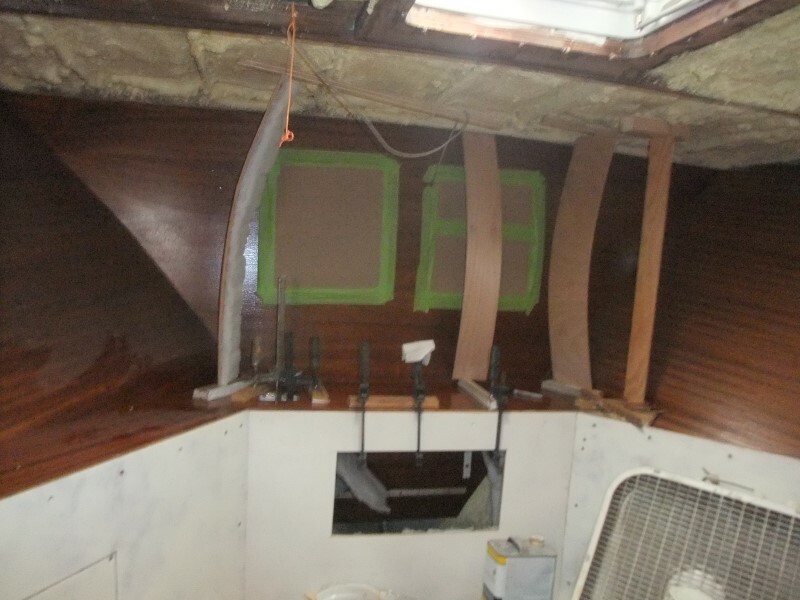 I'd also advise getting a Shopsmith, but the cost of entry is a bit higher than just taking on an abandoned boat, where the cost comes later and more gradually! I was getting sick of spending every single weekend in the boatyard, so I took the Labor Day weekend off and spent time on other hobbies of mine. It turns out that many of the same skills and abilities used in cabinetmaking also come in handy gunsmithing! 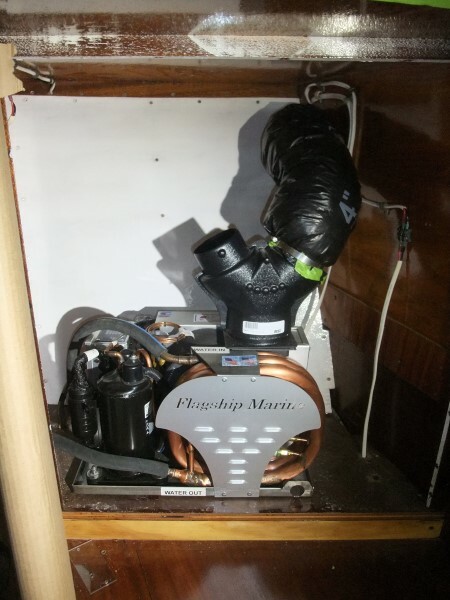 Anyway, after a long weekend away I got busy in the aft stateroom laundry closet next, which had the benefit of being lower in the boat and, therefore, much cooler while summer winds down. 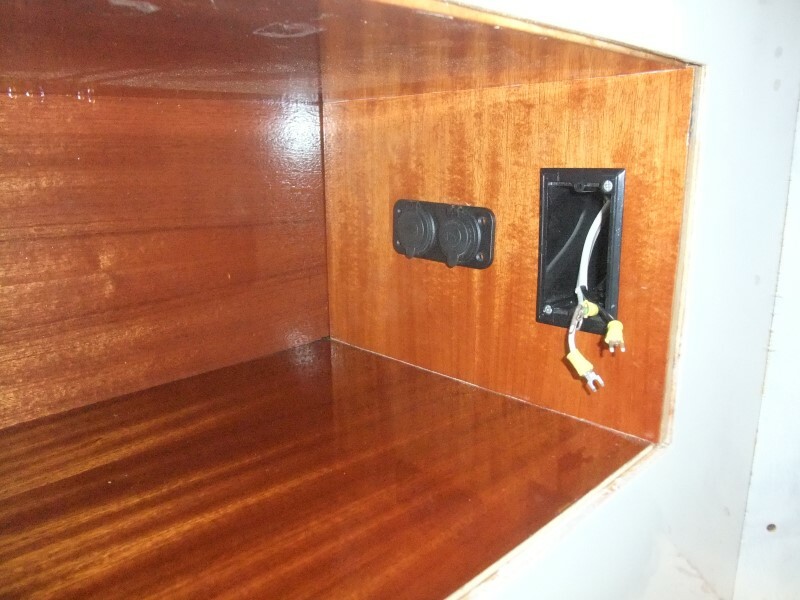 I did some woodworking, then installed 8/4 cable to a breaker sub-panel that will power the big appliances back here--the washer, dryer, and AC unit. 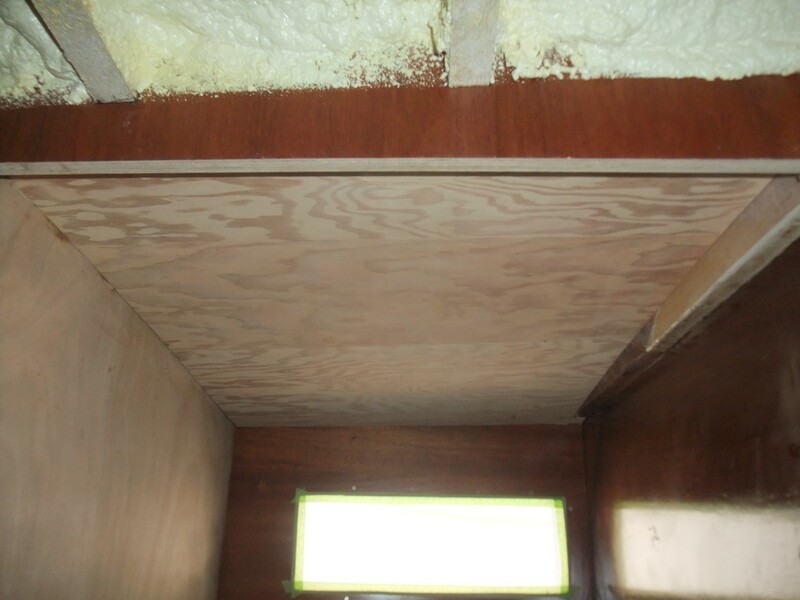 I got the laundry closet ceiling panel fitted and the backside insulated. 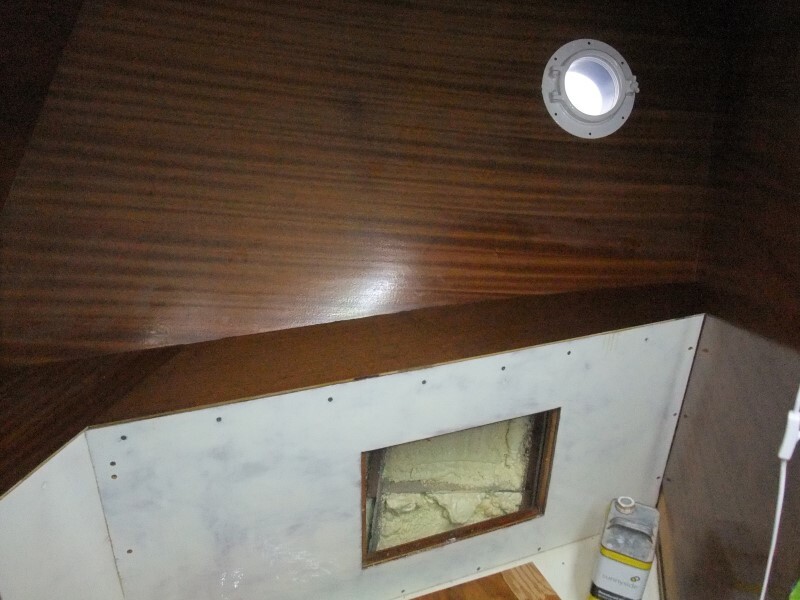 There was a bit of a hitch along the way, but everything turned out OK.
After making the box for the dryer vent that will fit into the back wall, I mixed up some white-tinted epoxy and coated the visible surfaces. They turned out pretty good!